In order to survive, we do what it takes — even if that survival comes at a much larger cost. If we decide to steal food and supplies to help ourselves, that means someone else goes without. Yes, we can show mercy and let those who wrong us off with a warning, but they could come back again later — and what example would that set with the rest of our clan? 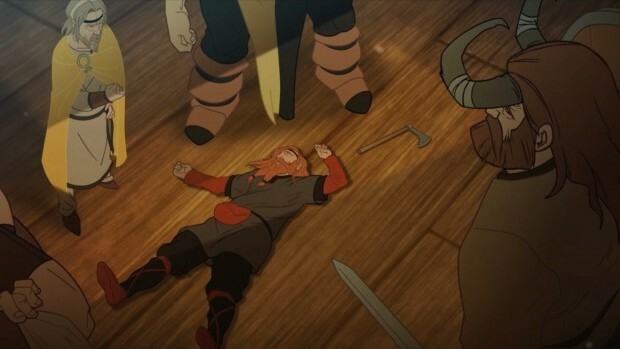 The Banner Saga forces you to make those hard decisions, and makes you live with the consequences. Inspired by the likes of viking mythology and the artwork of Eyvind Earle, The Banner Saga weaves an epic tale of a world on the brink of destruction. The gods are dead, the sun has stopped, and the landscape is enveloped in permanent winter. Humans and giant horned warriors called varls share a shaky alliance. People struggle to scrape out the most meager of existences, all while a massive horde of stone golems known as the dredge swarm across the land, destroying everything they come across. A humble hunter named Rook and his daughter Alette lead the remnants of their village to safety. Along the way they meet a menagerie of colorful characters, each with their own motives, goals, and desires. The Banner Saga does an insane amount of world-building within the first hour or so, constantly dropping Norse-sounding terms, places, and names. It’s overwhelming at first, but settles into a groove once you get a handle on the mythology of the world. And then it ends. While the 12-hour running time isn’t short, the story wraps up just as it really starts to get going. Planned as part of trilogy, it’s nice to know that this story isn’t over; I just wish that it hadn’t ended so quickly. The art direction makes it really easy to fall in love with this world. Clearly inspired by the backdrops and character design of Disney’s Sleeping Beauty, The Banner Saga relies heavily on striking colors and smooth, flowing animation. Its character designs are confident and mature in a way that few games have been able to muster, and is the best looking game I’ve ever played, full stop. Grammy-nominated composer Austin Wintory’s soundtrack perfectly complements the snow-swept tundras. Similar to his work on Journey, The Banner Saga’s music evokes feelings of longing and despair, but also of hope — with the right amount of Scandinavian influence for good measure. Like the art, Wintory’s music is without flaw. Games like Fire Emblem and Oregon Trail serve as the key inspiration for The Banner Saga’s gameplay. You’ll spend most your time watching your caravan of refugees make its way across the harsh snowscape as your stock of supplies dwindles. Comparisons to Oregon Trail abound, as you’ll have to manage your caravan’s morale, make sure you purchase enough food to make it to your next destination, and choose how you’ll get there. The Banner Saga wants you to live with your decisions, for good or for ill — decisions that can have sweeping effects on your friends and followers. Make poor choices, and important figures in your community will die with little fanfare. These choices can’t be undone — The Banner Saga doesn’t let you manually save your progress. It would have been nice to at least get a confirmation that the game had saved — I quit several times before it had actually saved my progress, and I was forced to replay a few battles because of it. Combat is accessible and surprisingly deep. Rather than bogging down in a quagmire of stats, equipment, and skill trees, combat focuses exclusively on the interplay between three variables: health, defense, and willpower. Strength is tied to your health stat — the more health you have, the more damage you’ll deal. Defense prevents damage dealt, and health and defense can be targeted separately. An enemy with a high defense stat is going to be difficult to whittle down, but it can be advantageous to go right for their health in order to prevent them from annihilating your party right away. By spending willpower, you can buff your attack and movement ability to quickly change the tide of battle. You move your troops around each map like a chess board, taking turns exchanging blows with your enemies. The Banner Saga rewards proper troop placement and balancing attack types, while the brilliant hand-drawn animations will keep you engaged in-between turns. Enemy types repeat themselves too often but fights are entertaining, and the desire to see what comes next greatly outweighs the repetition. Emerging victorious in battle and making the right decisions in-between rewards you with “renown” — essentially The Banner Saga’s currency. You can spend renown on accessories, supplies, or you can use it to level up your troops. Renown is plentiful for the first half of your quest, but after a while you’ll need to curtail your spending — renown gets surprisingly scarce later on, and you’ll need to weigh the benefits of increasing the strength of your followers with your ability to feed them. Keeping your caravan safe is of the utmost importance. Not only are you charged with protecting your villagers, you’ll need them when you get attacked by large groups of dredge. Your decisions have impact, and you find yourself connecting with your townspeople in a way that few games can accomplish. You will feel it when your people die — and they will die. Such is the price of responsibility. Filled with strategic gameplay and impactful decisions, The Banner Saga is a gorgeously epic Norse-inspired adventure whose only real fault is that there isn’t more of it. I can’t wait for part two.